A few weeks ago, Emil Eifrem, CEO of Neo Technology gave a webinar introduction to graph databases. I watched it as a lead up to my own presentation on graph databases and Neo4j. Right around the 54 minute mark, Emil talks about a very interesting experiment showing the performance difference between a relational database and a graph database for a certain type of problem called "arbitrary path query", specifically, given 1,000 users with an average of 50 "friend" relationships each, determine if one person is connected to another in 4 or fewer hops. Against a popular open-source relational database, the query took around 2,000 ms. For a graph database, the same determination took 2 ms. So the graph database was 1,000 times faster for this particular use case. Not satisfied with that, they then decided to run the same experiment with 1,000,000 users. The graph database took 2 ms. They stopped the relational database after several days of waiting for results. I showed this clip at my presentation to a few people who stuck around afterwards, and we tried to figure out why the graph database had the same performance with 1,000 times the data, while the relational database became unusably slow. The answer has to do with the way in which each type of database searches information. Relational databases search all of the data looking for anything that meets the search criteria. The larger the set of data, the longer it takes to find matches, because the database has to examine everything in the collection. Each new batch of friends to look at requires an entirely new scan of the table/index. So more records leads to more search time. 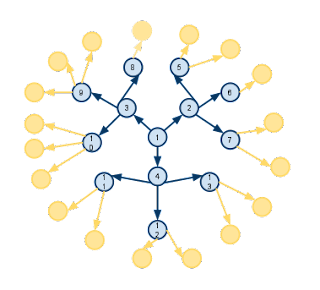 Conversely, a graph database looks only at records that are directly connected to other records. If it is given a limit on how many "hops" it is allowed to make, it can ignore everything more than that number of hops away. Only the blue records are ever seen during the search. 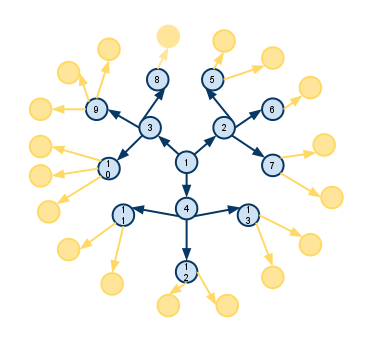 And since a graph traversal "remembers" where it is at any time, it never has to start from the beginning, only from its last known position. You could add another ring of records around the outside, or add a thousand more rings of records outside, but the search would never need to look at them because they are more steps away than the limit. The only way to increase the number of records searched (and thereby decrease performance) is to add more records within the 2-step limit, or add more relationships between the existing records. So the reason why having 1,000 vs. 1,000,000 records causes such a stark difference between a relational and a graph database is that relational database performance decreases in relation to the number of records in the table, while graph database performance decreases in relation to the number of connections between the records. Well written post. The explanation is fairly simple, but it seems to shoot over the heads of people in discussion without the example. That said, I don't know many companies that are doing the 4 levels deep comparison of millions of friends ;). I won't name names, but I'll bet the company's name rhymes with "blinkeden." what about if we use hash indexes in database? I think it is not fair to compare graph against NOT INDEXED relational table. I believe if you'd use index the results wouldn't so encouraging.